March 2nd, 2015 March 2nd, 2015 UnaXComments are off for this post. As I’ve currently hit a wall playing around with my Raspberry Pi, I’ve decided to write a post about something completely different. Since we moved to a new apartment, I haven’t slept very well. To be honest I’ve never really slept well unless I had the chance to get 8-10 hours every night. In my attempts to rectify it, I decided to try using technology to see if I could get a better idea if there were any patterns in how I slept. 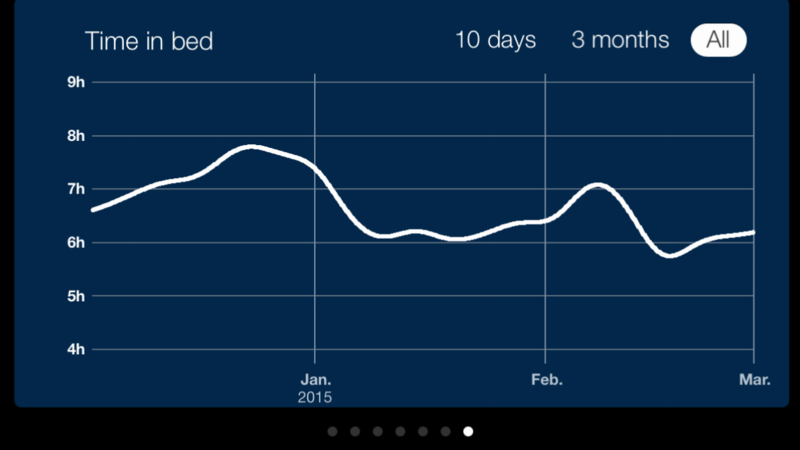 After looking around the internet, I fell upon Sleep Cycle, which seemed interesting. After reading how it works, I decided to buy the app for my iPhone as I figured the cost of €1 was okay, even if I never did find out anything by using it. How it works isn’t exactly rocket science. You simply enter when you want to get up and through analyzing your movements through the phones accelerometer it tries to wake you up within a 30 minute interval from your set time. It tries to do it when you’re already moving around, so you shouldn’t be in deep sleep. As you can see I went to bed a 00.16 and got up again at 06:26, getting 6 hours and 10 minutes in my wonderful bed. According to the graph and the sleep quality at 56%, I didn’t sleep too well and had quite a few spikes of being ‘nearly awake’. As I felt pretty crap when waking up I chose the bad smiley! The statistics show I’ve been doing this for 85 nights so far and that has chalked up to 3.4 weeks in my bed, averaging at 6 hours and 37 minutes per night. 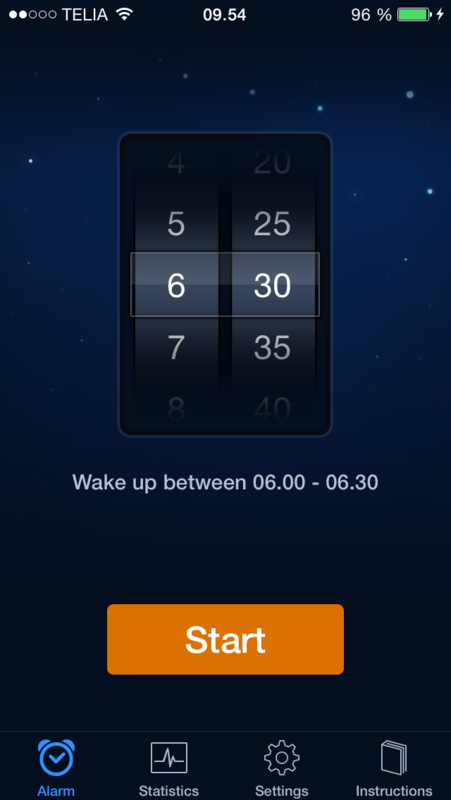 You get prompted by this every single morning and not shown on the picture here, is that it also shows what night you slept best, worst, longest and shortest. Here is a graph over how much time I’ve spent in bed in general. As you can see it’s been dropping to less and less time, but this is more to do with the fact that I started doing to monitoring during my Christmas Holidays, than a general lack of sleep since. Now a graph over when I’ve went to bed and apart from a few spikes before midnight, I might have issues going to bed early which could somehow be one of the sources of why I’m not sleeping very well. 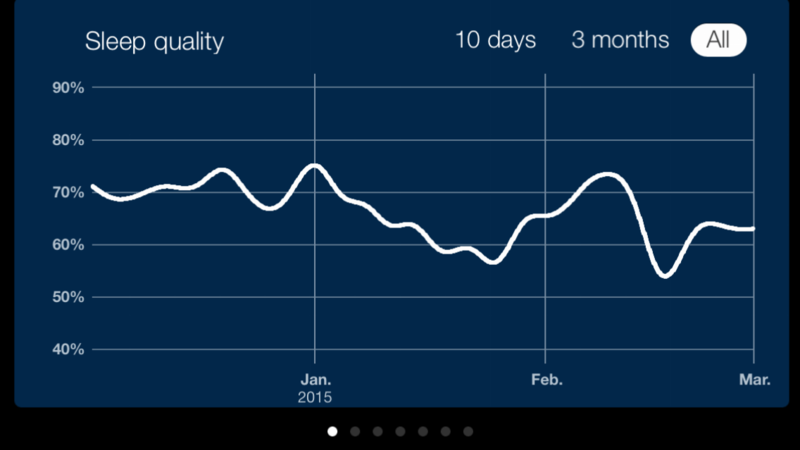 This graph shows my calculated sleep quality, which is a number it gives in percentages. I have no idea how they actually calculate this number, but it shows pretty well that after the Christmas Holidays ended, the quality of sleep has gotten worse. 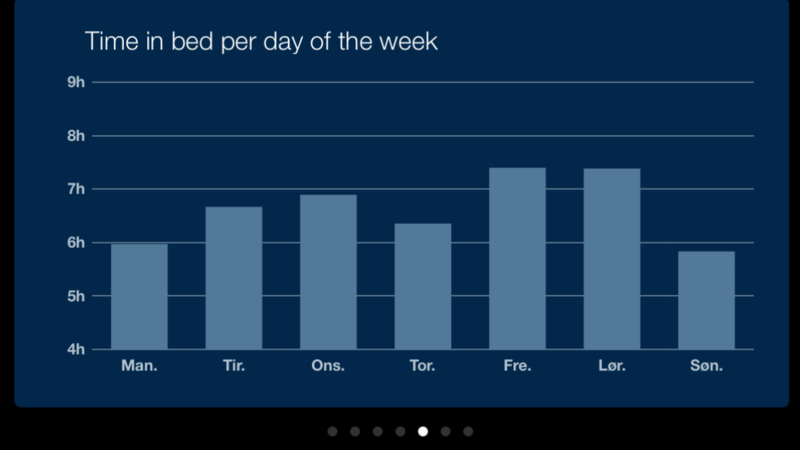 Next graph shows how long I’ve spent in bed on different weekdays. It comes as no surprise that it’s Friday and Saturday night that I spend most time in bed, seeing as it’s the weekend and all. 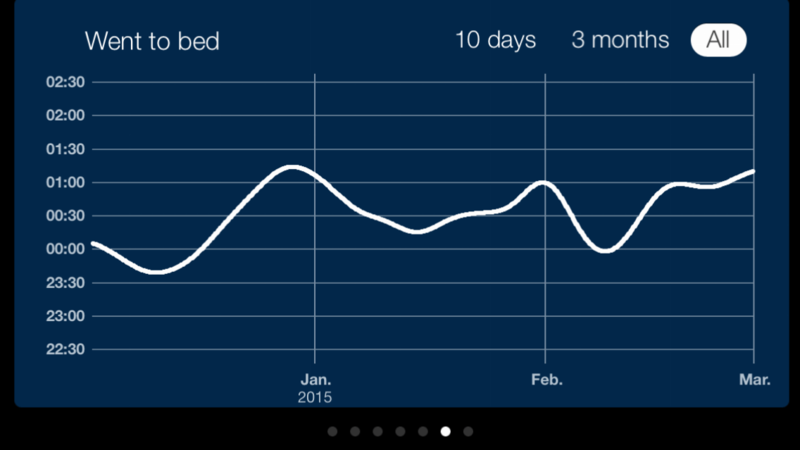 More interesting it is to see that the night I sleep the least is Sunday night. Apparently I have some problems adjusting to being able to stay up late Friday and Saturday and adapting to Sunday being an overall bad day to stay up late. 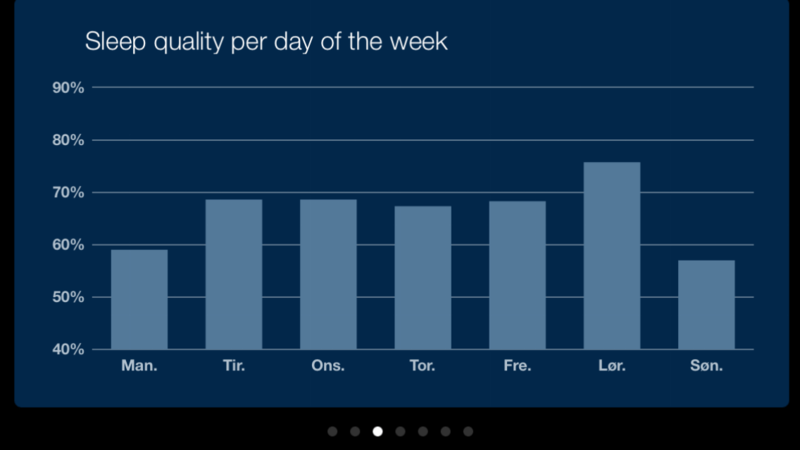 Here we have the rather arbitrary sleep quality percentage spread out on the different days of the week. As most of the other graphs show Sunday night is just plain bad and the fact that I sleep more in the weekends I also tend to sleep better on Saturdays. Remember the sleep notes I was mentioning earlier in the post? 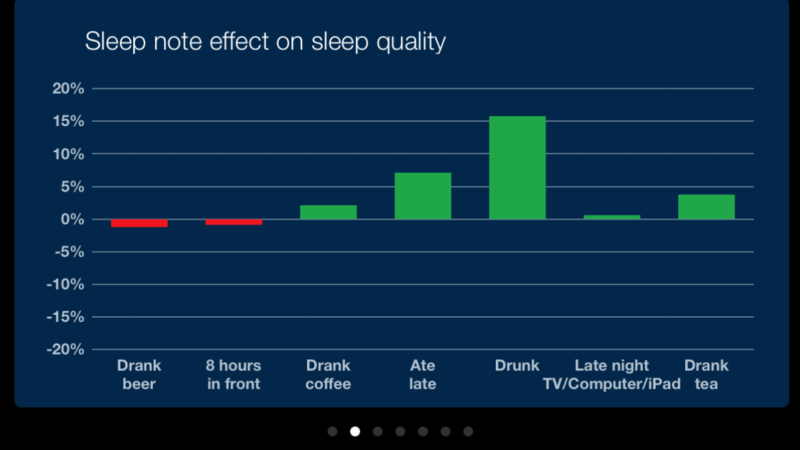 Well here they are and here they show the effect they have on my sleep quality. For some reason it seem that I sleep really damn well when I go to bed drunk. I think it might just be a coincidence that I slept well the one night I actually went to bed drunk (and remembered to set the alarm). Else it shows that drinking one or two beers and sitting 8 hours in front of a computer has the worst effect on my sleep (actually it’s the only two who have a negative effect). Too bad that my job is sitting in front of a computer for 8 hours a day and that I usually top it up with sitting some more in front of a computer at home too. Having a cup of tea looks like it’s actually working out for me. The last graph it gives me, is a rather recent addition to the app. How the weather conditions affect my sleep. Honestly, I’m not really sure if this graph has any merit but according to it it could seem that I sleep best when it’s partly cloudy (so I don’t get affected by moon rays? ), foggy (again shielding me from the evil moon rays!) or snowy. 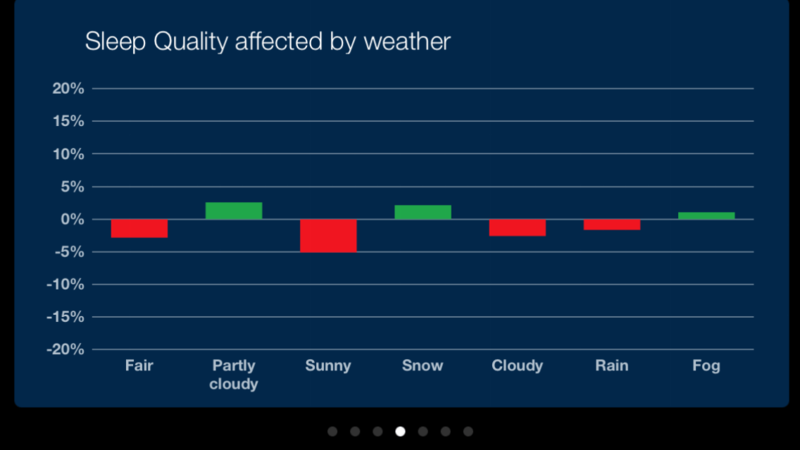 As I sleep in a very dark room next to my wife, where the weather outside has very little effect on anything, I’m not sure what-so-ever on this graph. What this tells me is more coincidentally if you ask me. 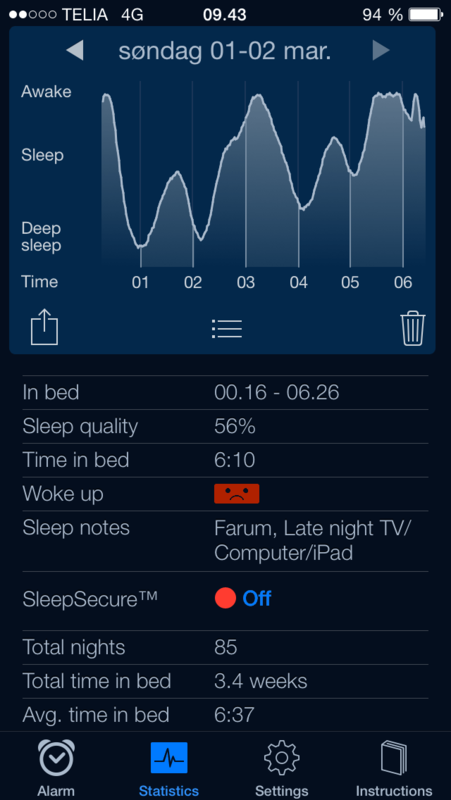 So, has using Sleep Cycle actually helped me improve how I sleep? Has it given me a better idea of just exactly what I can do to sleep better? Honestly, I’m not quite sure if the app has helped me very much in any aspects. First of all, I’m not certain that it actually works as intended. It’s supposed to monitor vibrations through the accelerometer of my phone and if you do the test the app has if it actually monitors you it seems to work technically. However, I sleep in my bed next to my wife. According to the website it needs a few days to actually get accustomed to the different conditions, like being more than one person in the bed and how the other persons movements affect the monitoring. When I look at the graphs I can see spikes every single night. If they came from just me moving around, I can’t understand why they last for quite a while. It could be because I react to my wife getting up to take care of my crying son or simply because my son is making ongoing noises while sleeping, but I’m still not sure. I think you have to take the movements and the arbitrary calculated sleep quality percentage with a grain of salt and focus a lot more on the sleep notes. Currently I have the sleep notes showed earlier in the post, but I think I could start adding a lot more. 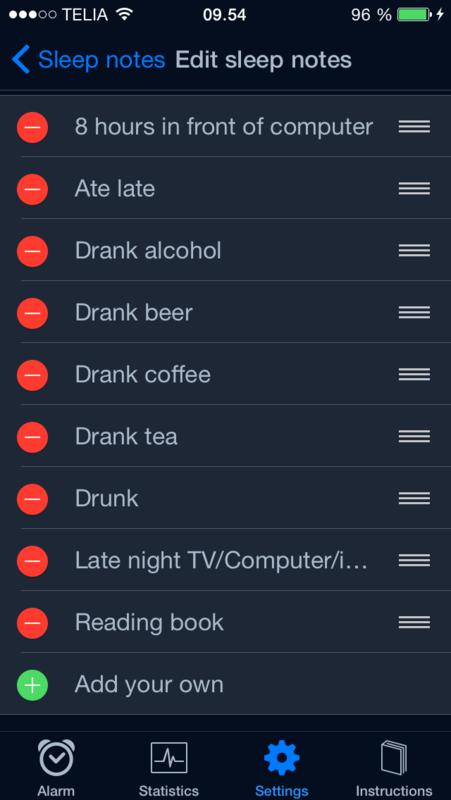 Like ‘Painkillers’, ‘No meat today’, ‘No Lunch’, ‘Exercised’ and so on and then being a lot more consistent in actually selecting sleep notes when going to bed. This way you’d get some kind of inclination towards stuff that you could do to make your sleep a lot more enjoyable. As to the app and its usefulness, I’m not sure that it will work for everybody. For now I’ll keep on monitoring my sleep and maybe look into adding more sleep notes, to get an even better picture of how different stimuli affect my sleep. But using the app itself and not doing anything about the results you get, will mean that it just wont do anything. Anyhow, I think the idea of sleep monitoring is really interesting and that even though the results might vary there can be some merit to actually thinking about what you do before going to sleep. Not necessarily trying to take a technological view on it, but simply create a routine and stick to it. After this sidetrack from working on my Raspberry Pi Home Server, I’ll get back to it during the week (if work, family life etc. permits me).